Recently IRAS added website development cost to be able to claim under PIC. Look at this link (PIC FAQ) and refer to Question #24 of FAQ. Please note that it is applicable for YA2014 to YA2018 only and not for previous years. The Productivity and Innovation Credit (“PIC”) scheme was introduced in the Singapore Budget 2010 and now it has been extended for more three years until 2018. Businesses and Companies can enjoy 400% tax deductions/ allowances and/or 60% cash payout for investment in their web development activities and productivity improvements under the Productivity and Innovation Credit (PIC) scheme. This grant is given by the Inland Revenue Authority of Singapore (IRAS) for all business owners. 5. Registration of patents, trademarks, designs and plant varieties. 3. Have at least three local employees (Singapore Citizens or Singapore Permanent Residents with CPF contributions) excluding shareholders and partners who are directors of the company can qualify for PIC. Further the PIC bonus introduced in the budget 2013 under PIC scheme gives businesses a dollar for dollar matching cash bonus for YAs 2013 to 2015 subject to an overall cap of $15,000 for all 3 YAs combined. To claim the PIC grant you need to submit the PIC application form to the IRAS on time and must have all the required documents which will be needed in the form approval process before submitting the form. After submitting the application you need to wait for the decision from the IRAS. 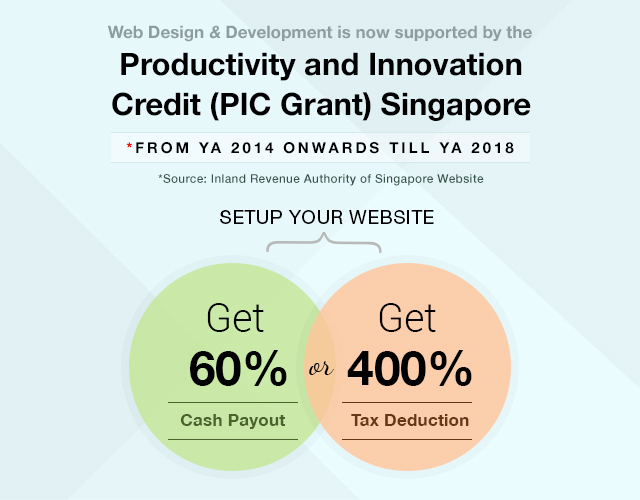 If you have any business idea in your mind and want to develop the website for your business, you can contact us and we will convert your idea into the reality and also you will get 60% cash payout or 400% tax deduction from the Singapore Government. To check if your website development and design work can claim government grants, please contact us for a free consultation.